While teaching yoga in 2005, Vicki Howie started singing a capella mantras during the final resting portion of her classes. She didn’t consider herself a “singer” at the time, but simply felt compelled to share the healing energy of the mantras she had learned from Deva Premal.As her students began asking her if she had a CD they could buy, Vicki gradually got used to the idea of creating one. She knew she needed to find the right musical partner who could bring instrumentals, inspiration and creative collaboration. 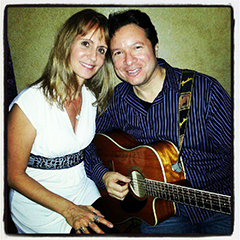 In late 2011, she met Singer/Songwriter Jeff Bonilla, and in early 2012 (a seven year cycle! ), she invited him to collaborate with her on a healing chakra album. The very first time, Jeff and Vicki got together to write, the creative synergy between them was palpable. In those first few moments, their First Chakra Song — Muladhara — was born. The music seemed to flow through them of it’s own accord. Following their muse and staying true to their mission, they got together regularly and created one song for each chakra, as well as a healing song (from one of the oldest mantras), an abundance song dedicated to Lakshmi, and a peace song (Loka Samastha). When they were finished, they decided to call their musical partnership, Mantrananda. It’s a Sanskrit name that means “the bliss of repetitive spiritual sayings” and it seemed appropriate because they both had experienced so much happiness and healing in the process of creating the album. Vicki and Jeff are really excited to share their debut album, “Chakra Love” with you. It was a mutual labor of love and it feels really satisfying to be able to share it with you now — and hopefully bring a little added peace, beauty and healing into your life. If you’re curious about the meaning of the mantras and the making of the album, just listen to the Audio Commentary on this page. It also comes as a download when you purchase the album.